[by Earl Blacklock] The American War of Independence, from 1775 to 1783, was an extraordinary event which changed the course of history. It was waged on multiple fronts, from the eastern seaboard to Canada, and it eventually drew in France, Spain, and Holland on the side of the rebels. George Washington, later to be the first President of the United States, was the general in charge of the Continental Army, which Congress had formed in 1776. By December of that year, it was an army in retreat, having been driven out of what is modern-day New York. Washington had fewer than 2400 men at arms, compared to more than 25,000 for the British. British generals Howe and Cornwallis were preparing to sail for London to inform their government that the revolutionaries had been beaten. The British had at their disposal battle-hardened Hessian mercenaries who now occupied the New Jersey side of the Delaware River. The Americans had limited supplies, with many marching without warm clothes or even boots. It seemed, indeed, that the end was near. Washington’s army was all that stood between the British forces and Philadelphia, where sat the Continental Congress. As the Continental Army retreated, Washington ordered 40 fishermen to go ahead of the forces and secure every boat capable of crossing the Delaware. These they collected and hid at the mouth of Knowles Creek, above Trenton. 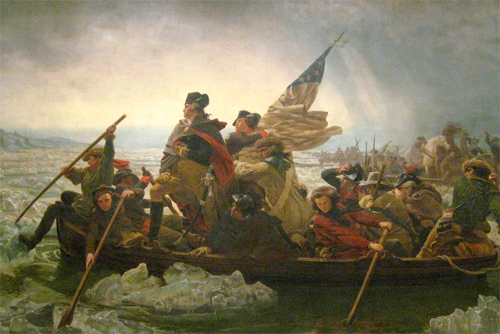 The British were preparing to cross the Delaware once the river froze sufficiently to carry its cannons. Washington was determined to cross it by boat in the other direction to achieve surprise. In Trenton, three regiments of Hessians and a troop of British light horse were celebrating Christmas. Their commander, Colonel John Gottlieb Rahl, had twice been warned to fortify the town, but he scoffed, boasting that Washington’s army could be beaten by a corporal’s guard. Had his troops been prepared and ready, he might have been right. Washington’s army marched in a blizzard, and their bleeding feet stained the ground red as they passed. By the time they arrived in Trenton, they were exhausted. Nevertheless, they achieved total surprise, and they took Trenton, inflicting heavy losses, while losing only five of their own men. Nearly a thousand of their foes were captured. The Battle of Trenton was the turning point of the war. It proved that, even against British and Hessian regulars, the Americans could hold their own. American irregulars, who had lost hope and hidden their arms, reassembled. The war would continue for years, but the Battle of Trenton set the stage for final victory. As believers, we are in a spiritual battle. At times, it may seem that we are marching to a battle with little hope for victory. We need to have the courage of David who, as he faced Goliath, said “All those gathered here will know that it is not by sword or spear that the Lord saves; for the battle is the Lord’s, and he will give all of you into our hands” (I Samuel 17:47). Next PostWill Marijuana usage make teenage boys shorter?